By Russell Jones. First published 2008. The Prahran & Malvern Tramways Trust (PMTT) left an enduring mark on the suburbs of Melbourne. 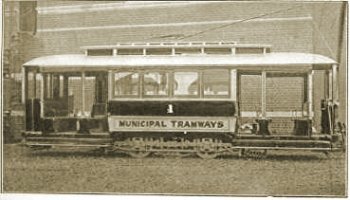 By far the largest of the independent electric tramways taken over by the Melbourne & Metropolitan Tramways Board (M&MTB) on 2 February 1920, many of its practices were continued by its successor, not least because the Chairman of the M&MTB until 1935 was Alex Cameron, the Chairman for most of the Trusts existence. The tram lines it built today form the basis for the lines in operation in the south-eastern suburbs of Melbourne, although the actual routes run on them are very different. The development of the suburbs of Prahran and Malvern in the first decade of the twentieth century saw an increasing demand for public transport that was not being addressed by the existing network of Victorian Railways. Residents were agitating for development of an electric tramway to meet this local demand, as was being promoted on the other side of the Yarra with the construction of the North Melbourne Electric Tramways & Lighting Companys line from Flemington Bridge to Saltwater River and Essendon. The Commissioners of Victorian Railways were eager to stave off any development of suburban electric tramways, for fear that they would siphon off railway passengers. Therefore, they acquired six Chelmsford steam omnibuses to operate a service between Prahran railway station and Malvern town hall. However, the service was not popular with passengers as the steam buses were not particularly reliable, and poor springing and rough roads led to a bone-shaking ride. They only ran from 1 December 1905 to 17 June 1906, after which the steam buses were placed in store. Victorian Railways Steam Bus No 4 on the route from Prahran railway station to Malvern town hall. The failure of the VR steam bus service did not quell the demand for better provision of public transport in the municipalities of Malvern and Prahran. Councillor Alex Cameron of Malvern led the push for an electric tramway service, succeeding in persuading the conservative Bent government to pass legislation to establish a municipal tramway operator, against the opposition of Victorian Railways. Local conservative and liberal members Thomas Luxton MLC (also a Prahran councillor), Donald Mackinnon MLA and Norman Bayles MLA shepherded the bill through Parliament. Minor amendments pertaining to working hours and staff wages were inserted at the insistence of Labor Party members. The Prahran & Malvern Tramways Trust Act 1907 (no. 2130) established the Trust as a body corporate to build and operate electric tramways in the municipalities of Prahran and Malvern. Alexander Cameron was elected Chairman of the Trust, and two councillors from each of Prahran and Malvern councils were appointed as members, with Thomas Luxton MLC being one of the representatives from Prahran. One of the key elements of the legislation establishing the Trust was that its constituent municipalities had to indemnify the Trust against capital losses. Construction began on 20 October 1909 on the first two routes: the High Street line from Charles Street, Prahran to Tooronga Road, Malvern, and a branch from this line south along Glenferrie Road to Wattletree Road, where it turned east to terminate at Burke Road. The permanent way was 4'8½" gauge laid with 90lb grooved rails on sleepers, ballasted with blue-metal and surfaced with tarred macadam and tarred rolled screenings. The depot, offices and workshop were located at Coldblo Road just off Glenferrie Road, Malvern. The fire at Elwood Depot of Victorian Railways in 1907 that resulted in the loss of the entire VR tram fleet led the Trust to equip all its facilities at the depot with the latest in fire fighting technology at substantial expense. A Grinnell fire sprinkler protection system with over 530 sprinklers was installed, operating off a 5000 gallon overhead tank fed by a six inch connection to the water mains, ensuring that adequate water pressure was always available for fire fighting. An automated Kirkby fire alarm was also installed that monitored the water pressure in the system. If it fell below a critical value that indicated the sprinklers were active, an electric alarm bell was set off in the nearby fire station. PMTT opening day, 30 May 1910, at Malvern Depot, Coldblo Road. Photograph courtesy City of Stonnington. The Trust had decided on using overhead wires for the supply of traction voltage rather than the much more expensive underground electrical conduits used in the tramways in London, New York and Washington. Electricity was supplied by the Melbourne Electrical Supply Company from its Richmond power station, and transmitted at 4000V AC to the substation at the rear of the Coldblo Road depot, where it was converted to 600V DC by massive rotary convertors  essentially large motor-generator sets. On 30 May 1910 the Trust was in business, opening its first two lines for traffic using thirteen single truck California combination cars built in Adelaide by Duncan & Fraser, painted in a chocolate and cream livery. Five minute headways were maintained along High Street from Charles Street, Prahran to Glenferrie Road, with ten minute headways over the rest of the system. PMTT A class No 1. During 1911 the operations of the Trust expanded, with an additional seven cars being acquired, the depot enlarged and the High Street line was extended on 14 May 1911 westward from Charles Street to Punt Road. On 11 July 1911 an Order-in-Council saw the municipalities of Prahran, St Kilda, Malvern and Caulfield empowered to jointly construct a tramway southwards along Glenferrie Road from Wattletree Road, and then westwards along Dandenong Road from Glenferrie Road to Chapel Street. The Trust was to control, manage and operate the lines on their behalf on completion. As part of these arrangements, the Trust was reconstituted with one member from each of the municipalities of Prahran, Malvern, St Kilda and Caulfield. The Dandenong Road line was subsequently opened to the Windsor railway bridge on 16 December 1911, and to Chapel Street on 31 March 1912. To work the increased network, four bogie tramcars (21-24) were placed into service in January 1912. Another two single truck cars (eventually numbered 46-47  the first car was numbered 36 for some time) were delivered in July 1912 to cater for the extension of the High Street line westward to the cable tramway along St Kilda Road, which opened on 14 September 1912. This extension required the agreement of the municipalities of St Kilda and Melbourne, which had not previously been forthcoming. One of the conditions of the extension was that those municipalities would receive an annual payment of the profit earned on the extension, based on the car mileage on the extension as a proportion of total car mileage. The following year saw the substantial increase of the Trusts activities. The Balaclava Road line was opened on 12 April 1913 from Dandenong Road, Malvern to the St Kilda Beach Esplanade via Hawthorn and Balaclava Roads and Carlisle Street. This was followed on 30 May 1913 by an extension northwards along Glenferrie Road, then branching at Cotham Road eastward to Burke Road, Camberwell, and westward to High Street at Kew Post Office. 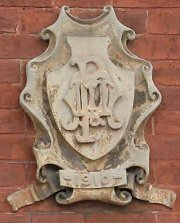 The expansion saw the need to reconstitute the Trust, with representatives from Kew and Hawthorn Councils being admitted as from July 1913. Part of the administrative rearrangements saw those lines that were not the property of the Trust but built on behalf of the respective municipalities transferred to the ownership of the Trust. 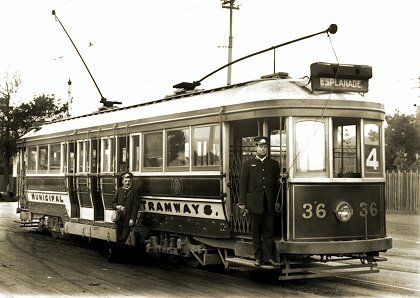 The Elsternwick tramway was opened on the date of 13 November 1913 from Balaclava Junction (on the corner of Hawthorn and Balaclava Roads, Caulfield) via Hawthorn and Glenhuntly Roads to Elsternwick Railway Station, and via Glenhuntly Road to Grange Road, Glenhuntly, and via Balaclava and Waverley Roads to Darling Road East Malvern. 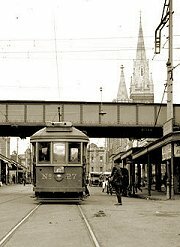 This expansion required the addition of eleven bogie tramcars (24-35) and sixteen single truck tramcars (48-63) during 1913, doubling the size of the tramcar fleet in a single year. What followed was a year of consolidation. The only expansion to the network was the construction of the Caulfield Station loop, built to cater for race-day traffic for the nearby Caulfield Racecourse, and the extension of the High Street line from Tooronga Road to Glen Iris, opening on 24 April 1914 and 28 March 1914 respectively. 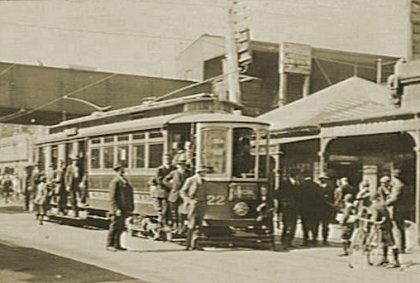 Another ten bogie tramcars (36-45) were delivered during the year, and a new substation was completed in December 1914 in Rusden Street, Elsternwick, in preparation for the planned extension of the Elsternwick line to the beach at Point Ormond. Plans for the further growth of the PMTT network were also developed. 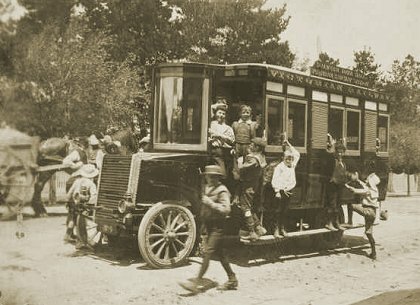 The Kew Tramways Act 1914 empowered the municipality of Kew to acquire from the Melbourne Tramway & Omnibus Company the lease and assets of the Kew horse tramway, which extended from Victoria Bridge to Boroondara Cemetery. This was to be converted to an electric tramway, and extended along High Street to Harp Road, East Kew. PMTT A class No 20 at the interim Kew tramway terminus near Kew Post Office, prior to the extension to Harp Road. The distance of the Coldblo Road depot in Malvern from this extension would result in an excessive amount of dead car mileage, so as part of this expansion it was planned to construct a second tram depot, at the corner of Barkers Road and High Street, Kew. Both the capital and operating expense of the fire protection system at Malvern Depot had been of concern to the Trust, and there were serious questions whether a system of comparable capability should be installed in the new Kew Depot, as there was some contention over its effectiveness in controlling a fire. 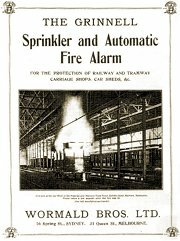 It was therefore agreed that the local agent for the sprinkler system, Wormald Brothers, would conduct a field test in Malvern Depot, which took place on 3 June 1915. Clearly both the agent and the Trusts Engineer, H.C. Dix, had a high level of confidence in the equipment, as the test was most realistic; so much so it is doubtful that any organisation would countenance a similar test in todays business environment. The Trust built a tram mock-up out of packing cases filled to a depth of two feet with wood shavings and kindling. The mock-up was probably built on a workshop dolly to allow it to be moved into the rear of the depot on 2 Road; the surrounding roads were emptied of trams, but there were still tramcars located on 5 and 6 Roads. After a liberal dose of kerosene, the Trusts Engineer lit the tram mock-up. The fire caught hold immediately, flames rising over eighteen feet into the air; seven sprinklers opened immediately, and within 30 seconds the automatic alarm called out the fire brigade from the nearby fire station, the brigade being in attendance 2½ minutes after the start of the fire. The fact that the Chief Officer of the Melbourne Fire Brigade was observing the test may have had some influence on the quick turn-out. Wormald Brothers recorded that the fire was extinguished 3¼ minutes after initial ignition, the only damage being a slight discoloration of the roof iron and purlins, and the trolley wire troughing needed scraping and repainting. Only 1000 gallons of water was used in extinguishing the fire. The field test offered compelling evidence for the efficacy of the automated sprinkler system in extinguishing depot fires, and a similar Grinnell system was installed in Kew Depot. Since this field test, no tram depot in Melbourne has been built without an automated fire protection system . With the construction of the Kew Depot, the Trust also entered the business of leasing commercial buildings, constructing a number of shopfronts as an integral part of the tram depot. The Trust during this period also acquired its first internal combustion powered vehicles  a Barford & Perkins Road Roller, a Tilling Stevens 40hp Petrol-Electric motor lorry, a Commer tower wagon and a Napier 15hp motor car. Despite this bold experiment, it still utilised a pair of horse-drawn tower wagons for some overhead work. The onset of the First World War resulted in a halt in expansion plans. Despite the commissioning of a substantial report in 1915 examining potential new lines and extensions across a broad area of south-eastern Melbourne, the Trust decided to entertain no further expansions, other than those already approved, until normal economic conditions returned. The first death of a Trust employee on active service with the AIF , James Henry Harvey, occurred at Anzac Cove Gallipoli on the evening of 25-26 April 1915. All in all, twelve employees would be killed in action and one died on active service during the duration of the conflict , with another thirty wounded. In total, one hundred and fifty-nine employees served with the military during the First World War, approximately 30% of the entire workforce, with a 27% casualty rate. This was substantially less than the casualty rate that was experienced by the AIF as a whole, where one in five were killed, with a total casualty rate of 60%. To support its staff volunteering for active service, the Trust agreed to make up any shortfall in pay between their military pay and what they had been receiving as wages or salary from the Trust, so as not to disadvantage their dependents. The Trust also decorated a tram to advertise the sale of war bonds. PMTT war bonds tram about to depart from Malvern Depot for the run to St Kilda Road (route no 13). Photograph courtesy Australian War Museum. Despite the difficulty in obtaining materials for new tramcars and the expansion of the tram network due to wartime conditions, the Trust did continue to expand, albeit at a slower rate. 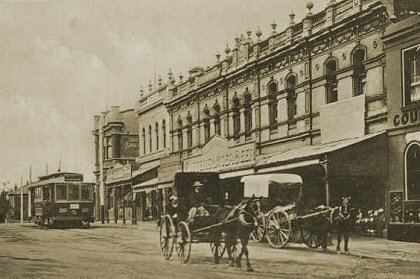 The conversion of the Kew horse tram to electric traction proceeded, the first stage from Victoria Bridge, Abbotsford, to Kew Post Office opening on 24 February 1915. The section to Boroondara Cemetery followed on 8 May 1915, with the extension of the line to Harp Road, East Kew being delayed to 26 November 1915, due to the late completion of a new substation at Kew Depot. Also completed in 1915 was the extension of the Elsternwick line to the beach at Point Ormond on 4 June, and the Malvern Road line from St Kilda Road to Burke Road Gardiner on 8 April. Twenty single truck tramcars (64-83) to operate these new lines arrived in 1915. An additional un-numbered works car was acquired in 1915, and equipped with rail groove scrapers and water tanks for keeping the dust down. This car was decorated in 1916 to support recruitment of volunteers for the AIF. The Trust also underwent its final administrative enlargement in 1915, with a member from the municipality of Camberwell being appointed. In 1916 the Hawthorn Tramways Trust (HTT) was suffering from a shortage of tramcars to operate its new network, so the PMTT sold it four less than satisfactory bogie tramcars (21-24) . 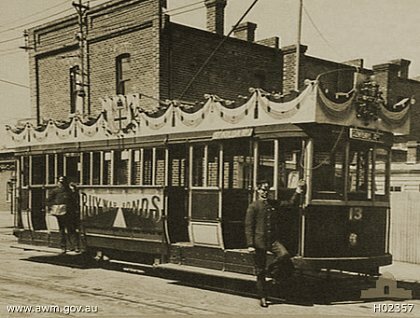 The difficulty in transferring these tramcars between the two unconnected systems, even though they intersected at the corner of Riverdale and Glenferrie Roads, led to discussions regarding interconnection of the two tramways. This led to a 1918 agreement with the HTT to purchase land on the south-western corner of this intersection to round the curve, to enable the laying of connecting curves between the two systems, although this did not take place until after the takeover by the M&MTB. The replacement of these four tramcars and the onset of wartime inflationary pressures led the Trust to depart from its normal practice of contracting out new tramcar construction to external suppliers. Instead, it decided to build six single truck tramcars (21-24 and 84-85) at its Coldblo Road workshops during 1916-17, utilising mostly Australian timbers and locally produced trucks, magnetic brakes, and wheel and axle sets. These were built using day labour, and costs were expected to compare favourably with those of external contractors constructing the bodies. Some initial preparatory machining work was carried on materials for these cars by James Moore & Sons of South Melbourne. The first four cars of this order were given the numbers of the cars sold to the HTT. The 50hp motors installed in these tramcars were recycled from the older maximum traction bogie drop-centre cars, which were in the process of being upgraded with 65hp motors to give them the same performance characteristics as tram No 36, which was originally delivered with the higher power motors. The construction of these six cars was judged to be a success, with costs comparable to pre-war car construction costs, so another six cars (86-91) were constructed during 1917-18 under the same scheme. The St Kilda Beach Esplanade terminus of the Balaclava Road line was adjacent to both the Luna Park amusement park and the Palais theatre, at the time the largest theatre/cinema in the Southern Hemisphere. As a result of tramway traffic generated by these popular attractions and the adjacent sandy pleasure beach, special tram services led to congestion at the Esplanade terminus, slowing down tram shunting and causing subsequent delays to scheduled services. As a result, a balloon loop was opened at the terminus to remove the need to change ends when shunting, being brought into traffic on 1 March 1916. Construction of the loop required the compulsory acquisition of vacant land at the terminus. A café, small shop, waiting shed and conveniences were constructed within the loop. The revenue generated by rentals more than offset the cost of interest generated by the acquisition of the land and construction of the buildings, the buildings being completed in late 1916. The tenant of the commercial facilities, a Mrs Leonard, opened the café on 20 December 1916. The landscaping of the grounds surrounding the café was designed by Carlo Catani  (former chief engineer of the Public Works Department) and a Mr Ashley, the curator of the St Kilda Foreshore Committee. 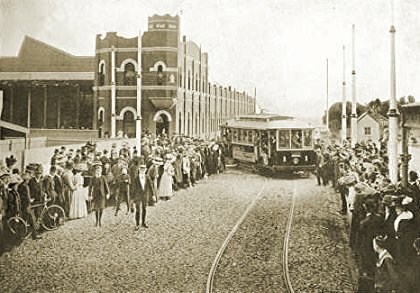 On the Victoria Bridge-Esplanade line, pedestrians transferring from the cable tram terminus at Victoria Bridge, Abbotsford (on the western end of the bridge) to the Trusts electric tram terminus on the eastern end of the bridge were subject to dangerous road traffic conditions. It was decided that the electric line would be extended across the bridge, which required substantial widening and modification to support the carrying of the electric tram line. The subsequent 230 foot route extension was opened on 10 June 1916. The last change to the Trusts system during 1916 was an extension of the Whitehorse Road line from Burke Road, Camberwell to Union Road, Mont Albert, which opened on 30 September 1916. This year also saw the Secretary of the Trust, W.O. Strangward, who had filled this position since 25 September 1908, resign from his post to take up the role of Secretary to the Melbourne Tramways Board on 1 July 1916. His place was taken by R.H. Shackell. PMTT D class tramcar No 36 at Deepdene, circa 1914-15. On 6 December 1917 the long-awaited extension of the Malvern Road line from its terminus northwards along Burke Road to Camberwell Railway Station was completed. The final increase in the Trusts network occurred on 7 March 1918 with the completion of the Burke Road line from Camberwell railway station to Cotham Road, Deepdene. However through working was not possible until September 1918, due to delays in Victorian Railways completing level crossing works. An additional six single truck cars (86-91) were delivered during 1917-18 to run this service. In 1919, the Trusts workshop undertook the completion of eight tramcars for the Fitzroy, Northcote & Preston Tramways Trust , receiving them from the car builder James Moore & Sons of South Melbourne in unfinished condition. The bodies were built to the same general pattern as the Trust cars numbered 92-100, but utilised different electrical equipment. The finishing work included painting, wiring and mounting the bodies on their trucks. Only some of the cars were completed prior to the M&MTB takeover. The Trust had standardised on use of the Newell patented electric brake as the standard service brake, but maintenance costs were high. It had been observing with interest the experience of the Melbourne, Brunswick & Coburg Tramways Trust (MBCTT) with its use of a completely air-braked tram fleet, and the consequent reduction in maintenance costs. 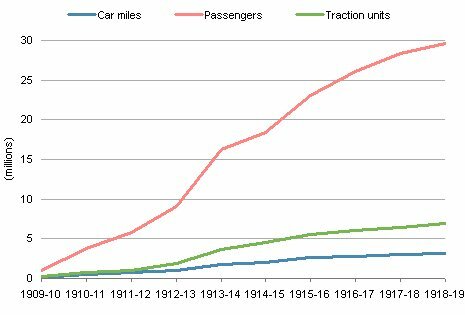 These results were confirmed by the Hawthorn Tramways Trust when it decided to convert to air-braked cars in 1917-18. The Trust therefore decided in 1919 to let a contract to the British Westinghouse Company to equip its entire fleet with air-brakes of the standard Westinghouse pattern. As part of this program, the last car of the order for nine single truck tramcars (92-100) by James Moore & Sons was quickly modified to be the first to be fitted with air brakes. It was subsequently used to familiarise staff with the operational and maintenance requirements of air-braked tramcars in advance of the rest of the conversion program, which was completed by 1921. The final tramcars designed and ordered by the Trust were six bogie drop-centre tramcars (101-106) fitted with equal-wheeled Brill 77E trucks, four motors and air brakes. Although not delivered until 1921, well after the takeover by the M&MTB, these tramcars would have a lasting influence on Melbourne tramcar design, forming the basis for design of the ubiquitous W class tramcars in all their many variations. Alex Cameron resigned from his role as Chairman of the Prahran & Malvern Tramways Trust on 31 October 1919 to assume the same role for the Melbourne & Metropolitan Tramways Board. The Engineer and Manager of the Trust, H.S. Dix, filled the position of Chairman for remaining three months of the Trusts existence, until it was taken over by the Melbourne & Metropolitan Tramways Board on 2 February 1920, as part of the State government plan to have a single tramway authority for all of Melbourne. All Trust tramcars were fitted with destination boxes, and two lights were used to identify the tram route at night, which was indicated by use of coloured glasses. During the day, the route number was indicated by a sign centrally mounted above the headlight. 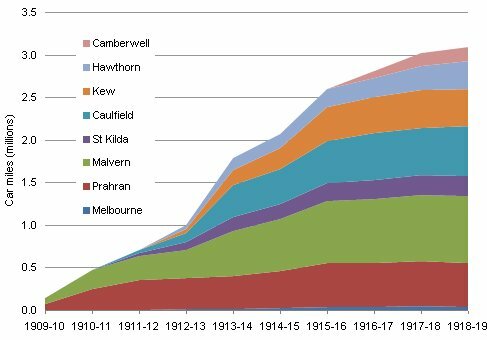 The key to understanding the financial history of the Prahran & Malvern Tramways Trust is that its prime objective was not to return a profit to its constituent municipalities. Instead, it was designed to promote their commercial and residential development by the provision of cheap, reliable and attractive public transport, and indirectly increase the municipal rates levied by the councils. This was also in the interest of many of the councillors, who often were involved in real estate development of their local areas. 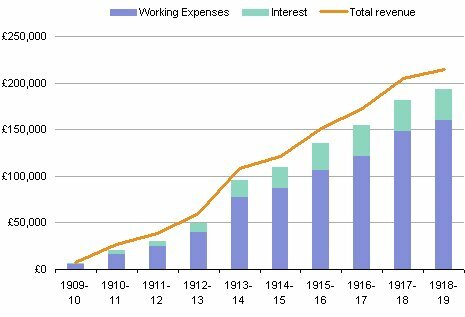 PMTT operational expenses and revenue, 1909-10 to 1918-19. Therefore, the Trusts activities were designed not to be a burden on the finances of the municipalities concerned, instead the objective was to meet working expenses and the interest bill, and if possible return a small profit to the municipalities. Most of the capital for construction of the tramway was raised through the issue of debentures. PMTT car miles by municipality, 1909-10 to 1918-19. Many of the lines it built were developmental in nature, and as a result the municipality that benefited from the construction of those lines was required to underwrite any operational losses that may accrue. As the representatives on the Trust represented the competing interests of each council, this provision was often applied to the construction of new lines, leading to fairly complex accounting procedures in order to correctly allocate costs and revenue to each line. Leaving apart such municipal operating subsidies, the division of any operational surpluses between the member councils was determined on the basis of car mileage in each municipality. The structure of the Trust led to a fairly conservative management regime, restraining the entrepreneurial Chairman, Alex Cameron, from over-reaching its financial and management capabilities. This innate conservatism was also reflected in its engineering practices, as seen from its relatively late adoption of air braking (some three years after the adoption of air brakes by the MBCTT), despite the significant reduction in maintenance costs that would accrue as a result. The Trust did not require any increase in borrowing powers beyond the £675,000 it had used up to 1915-16, although it had been granted legislative authority to borrow another £50,000. Instead, all capital spending beyond this period was achieved through reinvestment of revenue rather than borrowings. In part this was assisted by the brake applied on expansion of the Trusts network by the First World War, and the 1915 decision to defer the development of new tramlines other than those it had already planned. Once the war was over, there was also a reluctance to commit to new lines due to the anticipated formation of the Melbourne & Metropolitan Tramways Board, the enabling Act (No 2995) being passed in 1918. PMTT operational performance, 1909-10 to 1918-19. Several officers of the Trust assumed senior positions with the M&MTB, which led to many of its engineering and management practices being continued in the larger organisation. The chocolate and cream livery of the early years of the M&MTB was derived directly from that of the Trust, only being replaced by the well known green and cream in the late 1920s. Almost all of the Trusts tram lines have survived to the current day, the only parts closing being the Point Ormond from Brighton Road to the beachside terminus, the Caulfield Racecourse loop and the balloon loop at the Esplanade terminus, the site of which is now occupied by a McDonalds restaurant. The routes that operate over the former Trust lines are very different to those that ran during its existence, primarily due to the conversion of the cable tram system to electric traction and the gaining of access to the CBD, which markedly changed traffic patterns. Both Malvern and Kew Depots remain operational to this day, although both are significantly larger than when they were built, Malvern being the largest tram depot on the Melbourne system. Both buildings have been placed on the Victorian Heritage Register, as is the Rusden Street substation, although it no longer fulfils a tramway purpose. Three original Trust tram shelters have also survived to the current day. Finally, many Trust tramcars survived to be conserved by the tramway preservation movement, primarily as they were sold to the Adelaide tramways and the Victorian regional tramways of Geelong, Ballarat and Bendigo by the M&MTB between 1927 and 1951, after they had become obsolescent for use in Melbourne, thus surviving when most other trams of similar vintage were scrapped. Breydon, G. (1970) Feeding and Filling: the story of the Prahran & Malvern Tramways Trust, Running Journal, Tramway Museum Society of Victoria. Unfortunately the Brisbane Tramways did not follow this policy. The Paddington tram depot was not equipped with an automated sprinkler system, and a serious fire on 28 September 1962 led to the destruction of 65 trams and total loss of the depot buildings and associated facilities. This was a major factor in the wind-down and subsequent closure of the entire Brisbane tramway system by 13 April 1969. The first trams numbered 21-24 in the PMTT roster were a combination maximum traction bogie design. Half the car consisted of a saloon, and the other half was a closed crossbench arrangement with no aisle. This design required the conductor to ride on the footboard of the car to collect fares, opening and closing the sliding doors for each set of crossbench seats while the tram was in motion, similar to the design of contemporary car VR 20. Needless to say this was a dangerous practice, and would become increasingly dangerous as the amount of private motor vehicle traffic increased. These trams were the first cars disposed of by the M&MTB, being sold to the Adelaide tram system in 1927, which operated fifty similar cars. One of these ex-PMTT trams has survived into preservation at the AETM in St Kilda, South Australia, as Adelaide 192. PMTT O class No 22 on a test run prior to the opening of the Balaclava Road line. Catani Gardens on the St Kilda foreshore was named in honour of Carlo Catani. Later M&MTB R class tramcars 151-153 and 172-176. Copyright © 2008 Russell Jones. Reproduced with permission.